This week I've found a wonderful new product that I seem to now add to most of my meals! It is a brand of sun dried tomatoes - but unlike many sun-dried tomato products, these are moist. AND they are julienne cut - so in little strips ( or you can get them in halves, if you prefer). The julienne sliced ones are a perfect size to use and eat. There are 2 varieties - regular and smoked. The brand is called California Sun-Dry. They make other tomato products too, like a salsa, a pesto, a spread and a paste, but the packets of sun-dried tomatoes are the only things I've tried....so far! I sprinkle them on my salads, in my beans, in my soups, on sandwiches, with pasta.....I can hardly think of when I wouldn't use them. The smoked version I love with beans - in fact, that is just what I've had for my lunch!! !No need to soak, they are moist enough to eat. But obviously you can soak them if you want to. The tomatoes are dried over 7 - 10 days in the California sun shine. 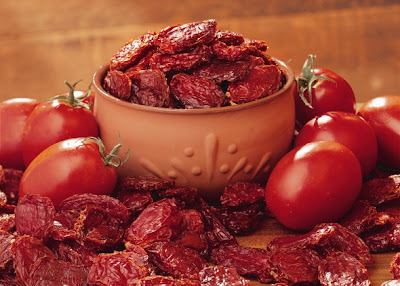 They are a great source of lycopene and the packet says that ounce for ounce, sun dried tomatoes have 12 times the amount of lycopene that is found in a raw tomato. Lycopene is a powerful anti-oxidant and helps protect against heart disease and certain cancer. Have you tried them? I rarely used sun-dried tomatoes in anything, until I found these!